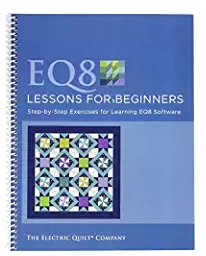 This step-by-step class will follow the EQ8 Beginners lesson book and explain the whys and how-tos. The lessons are easy to follow and cover the basics of each of the three main worktables of EQ8. You will design quilts, draw blocks, import fabric scans, print patterns and calculate yardage estimates. We will guide you through the lessons and help you in the difficult areas. Book is required. Purchase the book from The Sewing Circle and this class is FREE!